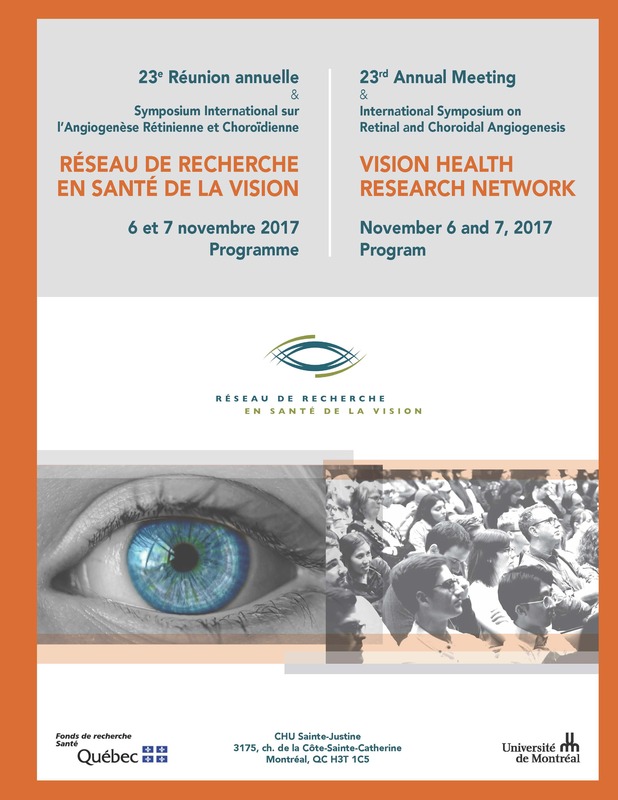 The 23rd Annual Meeting held on November 7th, 2017 at CHU-Sainte-Justine was a success thanks to the participation of more than 250 students, postdoctoral fellows, researchers, doctors, specialists, etc. This year, thanks to your faithful involvement, we were able to reach an impressive 150 presentations (posters and oral presentations combined), reaching a peak since the creation of the network’s annual meetings. At the end of the day, we were able to award 16 presenters for the best oral and poster presentations. The annual meeting was preceded by the first International Symposium on Retinal and Choroidal Angiogenesis organized by Dr. Sylvain Chemtob and was also very unifying. About 100 participants came to attend the presentations presented by eminent researchers in the field. For the occasion, Dr. Anne Eichman, professor at Yale University, internationally renowned, was the guest of honor at both events to present her most recent results (biography below). Following Ms. Tianwei Ellen Zhou’s initiative, medical student and chair of the VHRN Student Committee, the journal ‘’Annals of Eye Science’’ was a partner in the event. A special edition (March 2018) is now available online and includes abstracts (authorized by the authors) presented during the Symposium and the Annual Meeting. Dr. Isabelle Brunette, Dr. Sylvain Chemtob and Dr. Tianwei Ellen Zhou have signed the preface. Dr Anne Eichmann is a renowned vascular biologist and has made numerous breakthroughs in the field of retinal neovascularization. In addition to her current appointments as Professor of Cardiology at Yale University and being a faculty member of the Paris Cardiovascular Research Centre, she has also served on the INSERM Scientific Research Council, the European Research Council, and the Fondation Lefoulon Delalande fellowship board, and the editorial boards of multiple scientific journals including Physiology Reviews and Endothelium. She first obtained her M.Sc. at the Weizmann Institute in Rehovot, Israel, followed by a Ph.D. in molecular and cell biology from the Université Paris XIII and postdoctoral training with Nicole le Douarin in Paris. Current research in Dr. Eichmann’s laboratory focuses on exploring the factors that control the patterning of blood vessels, as well as understanding how the vascular and nervous systems influence each other’s growth and function. Her work focusing on the molecular and cellular relationship between the nervous and the vascular systems has led to a better understanding of the mechanisms driving vascularization of the retina. Among her important discoveries, she has shown the role of the protein Slit2 in retinal vascular development and demonstrated that inhibition of this factor could prevent pathological retinal neovascularization. Her scientific research has led to the publication of numerous seminal articles, including research articles in prestigious journals such as Nature, The Journal of Clinical Investigation, Blood and Nature Medicine among others. Dr. Eichmann has received multiple awards throughout her career, including a Liliane Bettencourt Prize for Life Sciences, the Chevalier de l’Ordre National du mérite, an Inserm Research Award, and the Jean Bernard Award from the Medical Research Foundation. The Network thanks all the participants, the volunteers, the evaluators and the organizers who made the day go smoothly. Thank you all for coming at this event!